Affirmative action is now the latest wedge issue in California to keep ethnic minorities from seeing our common interests. In California, a bill to revive affirmative action is dead. Mainstream media reports convey that opposition from insurgent Asian Americans groups killed the measure at the last minute. If this is true, then there is much work to be done in Asian American communities about the benefits of affirmative action. However, it is more likely that the measure was primarily opposed by white voters, and an over-hyped loud minority of Asian American opposition became a convenient scapegoat for lawmakers. 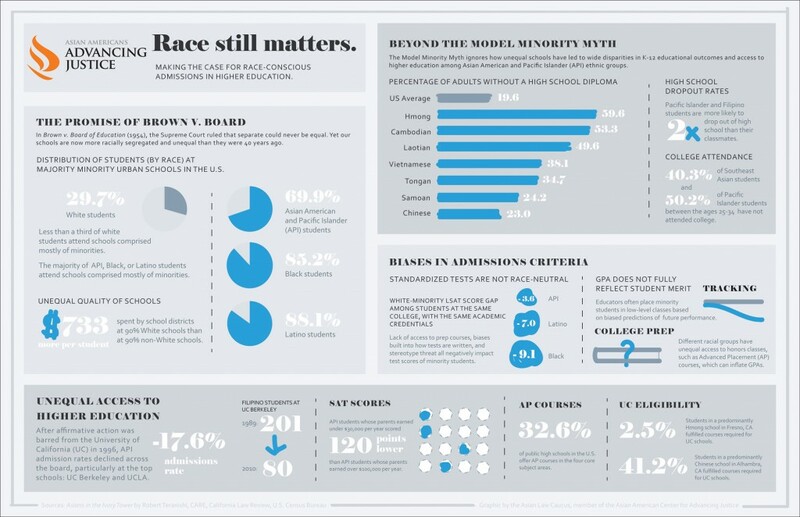 After all, more than 75 percent of Asian American support affirmative action programs. Even when Prop 209 was passed by overwhelmingly white voters, Asian Americans were scapegoated for supporting the repeal effort even though 61 percent of Asian Americans voted against the ban. The backlash against Asian-Americans for the latest affirmative action debacle is the same old “divide and conquer” strategy, and we must stop falling for it. I support affirmative action. I have written at length about the need for affirmative action, as well as why it is constitutional. Contrary to myths, Asian Americans have been hurt by Prop. 209, and projected Asian-American enrollment rates have fallen as a result of Prop 209. Moreover, Asian-Americans do not lead single issue lives. Many Asian-American women and LGBT Asian-Americans directly benefit from affirmative action. We need to restore affirmative action in California, and we need to stop allowing the white majority to use the increased Asian American enrollment numbers as a way to defend a ban that only they support overwhelmingly.